Love country style furniture? 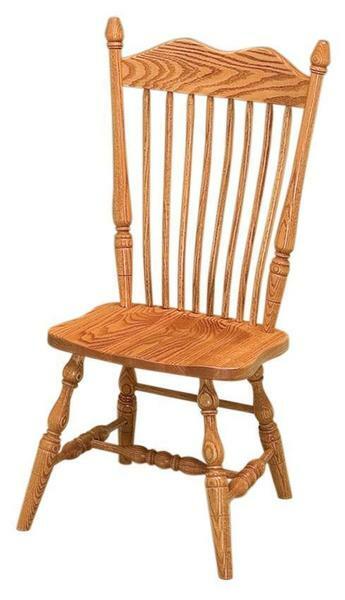 Then you'll love the Amish Hoosier Dining Chair. Creating warmth and invitation in your dining room, the Hoosier combines function and style with classic Windsor elements throughout. The crested top cross bar, which supports the back and anchors the spindles, features gentle curves to provide elegance and flow, while the turned legs offer a lovely old-fashioned form. The Hoosier is shown here in oak wood with medium stain. Oak furniture is a popular choice for a country kitchen or dining room. Oak wood features a heavily defined grain pattern that displays the character of the wood. The strength and durability of oak wood make it ideal for crafting furniture of substance.